Northampton is a town 52km north of Geraldton, in the Mid West region of Western Australia. At the 2011 census, the town had a population of 868. The town contains a National Trust building. The town lies on the North West Coastal Highway. Originally called The Mines, Northampton was gazetted in 1864 and named after the colony's Governor, John Hampton. 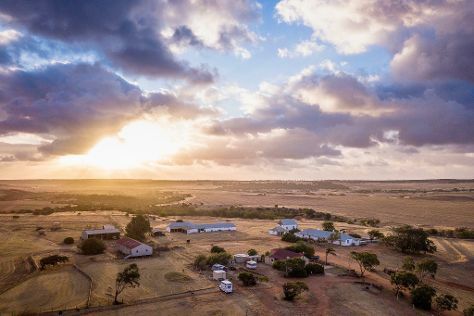 The town was sited in the Nokanena Brook valley, between the hamlets around the two major copper mines in the area, the Wanerenooka and the Gwalla.It is the service town to the micronation, the Principality of Hutt River.The town is known for its many wildflowers. Cave paintings at the Bowes River turnoff show that the region has been inhabited by Indigenous Australians.The surrounding areas produce wheat and other cereal crops. The town has a receival site for Cooperative Bulk Handling.HistoryLead ore was first found by explorer James Perry Walcott, a member of A.C. Gregory's party, in 1848 in the bed of the Murchison River, establishing the mining industry in Western Australia. By 1863, 980 tons of lead ore and 230 tons of copper ore were exported from the district, representing 14% of the colony's total annual exports, exceeded only by wool (52%) and sandalwood (18%). By 1877 the district's exports of copper and lead ores had grown 350% and were the colony's second largest export, still at 14% of the total, after wool (53%). Northampton is in Western Australia. Arrange all the small, but important details of your Northampton trip itinerary using our Australia trip itinerary planning app .